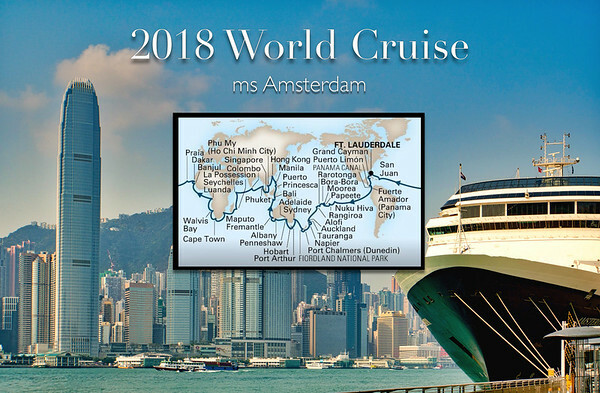 On January 4, 2018, we embarked on a 114 day around the world voyage visiting 39 ports in 26 countries on 4 continents.During this time we traveled 33,000 miles. We traveled on Holland American Line’s ms Amsterdam, a 62,735 gross tonnage ship (small by todays standards) with a passenger capacity of 1380, This ship was large enough to be comfortable yet small.enough to get into some of the more remote places that we went to. Below are the Ports of Call we visited this voyage. Click on any of them to see the other images of that stop.